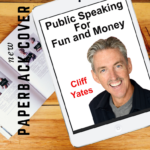 I am overwhelmed by the response from the people who have recently purchased my public speaking book. I have had several people who have now started their speaking careers by buying the book and taking action. Several have joined Toastmasters and have already given their first club talk. That is just amazing. Proud to see people educated themselves and then take actions on what they have learned. This has certainly inspired and motivated to get back to writing the next book. I have two in the works and a memoir. Public Speaking is one of those careers that can be very fun, and very lucrative. There are thousands of meetings and events held all over the country, and the world for that matter who desire speakers for their events. Yes, there are celebrity speakers that are going to be more in demand than someone just starting out. But not every meeting or event is going to have the fifty to one hundred thousand dollars these celebrity speakers command. But with just a little experience, great marketing tools, and the ability to hustle, you can start commanding two to three thousand dollars as a new speaker. So I am looking forward to mentoring more public speakers.